Besides missed school days, the wacky weather at the end end of January left frazzled, perplexed families sitting for hours in waiting rooms at family practice and urgent care centers. Between rescheduling work appointments, rearranging child care, and actually implementing steps to get well, the experience wasn't necessarily fun or convenient. In a like manner, when mold exposure becomes a persistent issue impacting your family, you can imagine proper testing to diagnose the problem and prescribe a solution makes a difference versus living out the costs and inconvenience that comes with doing nothing. If you live in Edenton, you may remember a tight situation that occurred before Christmas several years ago. In 2010, historic St. Anne's Catholic Church was at a crossroads. According to former bookkeeper Wendy Callahan, "test results confirmed that the readings on toxic molds were so high the church had to be closed." St. Anne's faced the potential of being unable to host pivotal Christmas services. Thankfully, the manner was resolved through scientific testing that is now more mainstream. Callahan reported Dwelling Management solutions and expert Harry Cannon "treated the church and basement facilities [...] including the air conditioning duct-work [...] in an expeditious time frame that would allow the church to be open.. [...] Independent tests confirmed the treatments were successful." More recently, in 2016, laboratory tests confirmed mold presence in the old Edenton DMV office on Broad Street. After vacating the building, Dwelling Management's Mold Defender products were applied and a clearance test was conducted by Home Spec of North Carolina. According to Larry Sellers, managing member of the affected property: "the spore contamination was mitigated and approval was given for DMV to re-occupy the facility." 'Mold' doesn't have to be a dreaded word when your family or organization has a plan to address it. 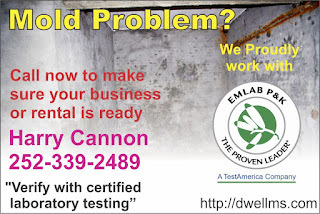 Results from Dwelling Management's testing partner- EM Lab P & K- a 30 year environmental analysis leader- can help you avoid unnecessary remediation or understand whether the spread has continued or stopped. If you are concerned about the inconvenience mold is holding over your life or the reputable operation of your organization, we can help you verify and take control in a timely manner. 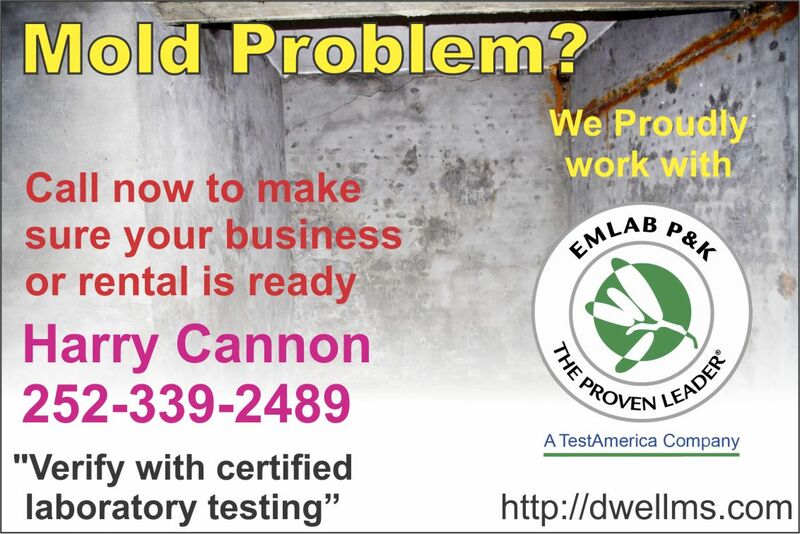 To find out what testing protocol can help you identify and reduce the impact of contamination, contact Harry Cannon and his team at 252 339 2489 or info@dwellms.com. Three members of Dare County Arts Council, Mary Edwards, Peggy Saporito and Bobby Wiltshire have been selected for the 2017 Watercolor Society of North Carolina’s 72nd statewide exhibition. A total of 266 entries were submitted for this year’s exhibition, which will be on display at Greensboro College’s Anne Ruff Galyon and Irene Cullis Galleries in Greensboro, NC October 15- November 18, 2017. Mary Whyte juried the show selecting 70 paintings for the annual exhibition. 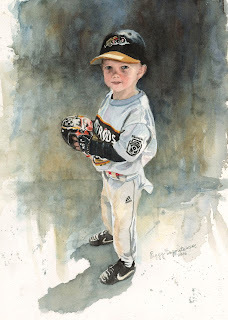 She is a watercolor artist, teacher and author whose figurative paintings have earned national and international recognition. Her portraits are in corporate, private and university collections, and in permanent collections of the South Carolina Greenville County Museum of Art and the Gibbes Museum of Art in Charleston. All are cordially invited to attend the Watercolor Society of North Carolina’s 72nd Exhibition Opening Reception on Sunday, October 15 at 2pm. 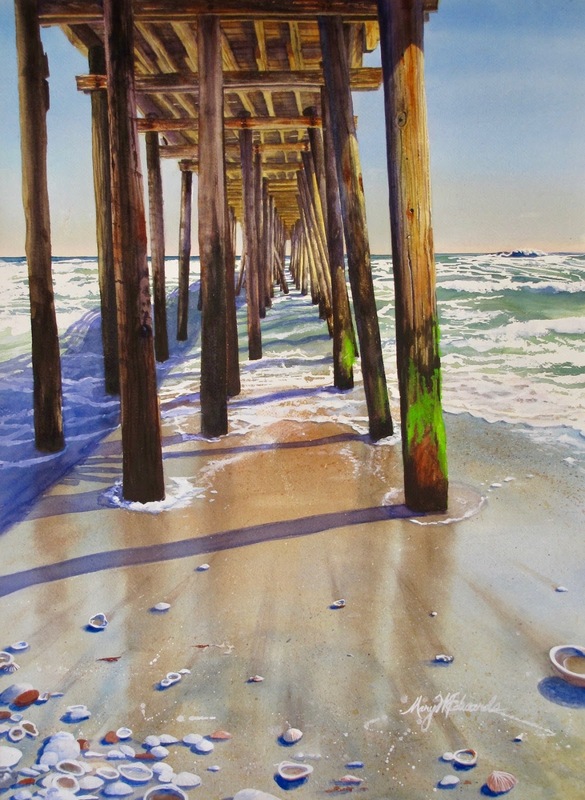 For more information about the Watercolor Society of North Carolina’s annual statewide convention and exhibit, please call 252 473 5558 or visit ncwatercolor DOT com. Dare County Arts Council is a 501(c)(3) nonprofit arts organization dedicated to supporting the arts in Dare County. While there is no archaeological proof that Virginia Dare was born on Roanoke it is accepted as a fact and is on the welcome sign as you enter the town of Manteo. The only evidence for this event is John White’s account, which is very credible and almost certainly true. The same man said the colony went to Croatoan yet that is not accepted without more proof, funny how that works isn’t it. In the last issue, we discussed the relationships the English had with different tribes in our area prior to the arrival of the 1587 “lost” colony. The English mainly interacted with two tribes: the Croatoan and the Secotan. The Croatoan were the first people the English met in the New World and they always got along. We know Manteo was from Croatoan and that the English had lived on Croatoan (Hatteras) in 1584 and 1585. We also know that in 1587 the “lost” colony sought help from the Croatoan after the Secotan (mainland Dare County) attacked them. The Secotan and the English took turns killing each other throughout 1585 and the Secotan had killed Englishmen in 1586 and 1587. The Croatoan and Secotan were also enemies. This historical context is important to understand. 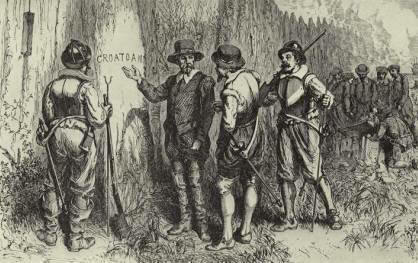 When John White sees the word CROATOAN carved on a palisade to indicate the colony had relocated there it was a well-known place and people and did not surprise White in the least that they had gone there given the situation they were in and the relationships they had with the surrounding tribes. Sadly, White was unable to get to Croatoan after seeing the message, thanks to a storm and his loss of influence over the crew after the death of Captain Spicer. We know the oral history as recorded in 1701 (long before it was cool) stated the colony assimilated with the Croatoan. Also in 1609 Jamestown colonist John Smith asked about the colony and was told by Opechancanough (Powhatan’s brother and future Chief) that the colony was at a place called Ohnaconan, which means great turning of salt water and is simply the old name of Diamond Shoals in Buxton on Hatteras Island ie Croatoan. Yet no one in Jamestown really looked for the colony. They were too busy starving to death themselves and probably assumed the colony with no resupply had perished. Remember the Jamestown colony had help from Indians too and still nearly all died even with constant resupply. So this explains why they did not look too hard for the colony. Instead, they assumed they must have died. The colony was more abandoned than lost. They gave a clear indication where they went and no one looked. Well we finally looked at Croatoan, the stated destination of the colony and what we have found is much bigger than figuring out where the colony went (something pretty much already known) what we found was the lasting impact of the colony was greater than anyone expected. The Croatoan themselves changed. They stopped using bow and arrow and started to use guns. The arrowheads cease and are replaced by lead-shot. The architecture of the longhouses changes from saplings to square beams. The diet changes from mostly fish and turtles with some deer and birds to nearly double the amount of deer and birds once guns are introduced. Even the tobacco culture changes from ceremonial usage to a daily habit. The pipes change, the diet changes even the clothes. We have found sewing needles, buttons, belt buckles and brooches to go along with gun barrels and thousands of lead shot balls. We even found a 16th-century rapier handle (a fancy sword). Perhaps the coolest discovery is that of a 16h century writing slate and lead pencil proving what Lawson found to be true when he wrote that the tribe had ancestors who could “speak out of a book”. I personally love seeing how English artifacts are repurposed. For example, we have a glass arrowhead and a gun barrel that was later used as a tree tapper to get sap. While some Elizabethan material is found in a 16th-century context much of it is found later in the early 1600s. This makes perfect sense because these items being so useful and irreplaceable would not have been thrown away for at least a couple decades. So some 16th-century artifacts have also been found in layers from the early and even mid-1600s. Because of this, some will argue it came from Jamestown and that the Jamestown guys brought over old tools and weapons from the 1500s and then traded them to Indians and they ended up in Hatteras. Yet Jamestown itself has less 16th century English material found in it than Hatteras Island and the Hatteras digs have covered less than a 100th of the area as the Jamestown digs. There will always be doubters and those who simply cannot accept the fate of the colony no matter how much evidence is shown. Take for example the patch found on a John White map that covers up what looks like a fort on the mainland. Think about that for a second, a John White map, John White the man who created it said the colony went to Croatoan. Men from Jamestown also visited the Chowan Indians from the area of the patch and were told the colony was “beyond the isle of Roanoke” and the Virginia Indians added they were at a great turning of SALT water, Ohnaconan. The Hatteras tribe themselves said the colony assimilated there and now 16th century English artifacts are being found there. For a normal person, this is enough evidence but ultimately people believe what they want. I have heard it said Hatteras could not support all of the colonists. This is nonsense and we have proven it. The amount of food, not just fish and deer and other animals but plants, farming equipment and seeds that we have found put that myth to bed easily. What is really sad is not that the colony was abandoned but that the Elizabeth model for settlement was abandoned. The people who came in the 16th century wanted to trade with the Indians and live with them not conquer them and take their land. Before the English ever came to the New World the idea was presented to Queen Elizabeth in a document that laid out all the reasons to go. In it, they talked about doing the opposite of the Spanish and making friends and allies of the Natives and learning their language. This is one reason Manteo and Wanchese were brought to England and the scientist Thomas Harriot was attached to the voyages to study the Natives and learn from them. What became lost was not a colony but a model of settlement and over time the truth became lost. We are working hard to bring that truth to the surface literally. Dr. Horton and his colleagues have put thousands of hours into researching everything we find. They have used an XRF machine to analyze all the copper and glass, they are breaking down the fish and animals by species and mapping out all the post holes of the longhouses we find. It is an immense amount of work and will all be published soon. The Croatoan Archaeological Society made it a goal to keep the artifacts on the island and display them for free to the public and we have done so. The thank you list would be longer than this article as so many on the island have helped as well as from England, Ireland, Norway California, Michigan and even China. Our digs are an international effort of professionals from a multitude of disciplines. It is amazing what this has grown into. When we began I was hoping to salvage some Croatoan artifacts before they were destroyed by development or by floods. It has blossomed into an international dig and we have very likely found the colony or what is left of them. If you want to be a part of making history by saving history go to cashatteras.com and make a donation. It goes to a worthy cause and is much appreciated. 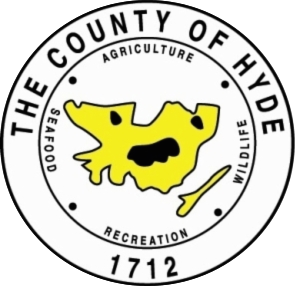 Ocracoke, NC 07/27/2017 - D ue to the power outage affecting Ocracoke Island, the Hyde County Board of Commissioners has issued a mandatory evacuation of all non-residents effective on Thursday, July 27, 2017 at 5:00pm. There is no deadline on when visitors must be off the island but we request that all visitors please attempt to be off the island by noon tomorrow . Ferries are currently running on their normal schedules. Dare County officials are requesting that visitors that are evacuating via the Hatteras Ferry please try and get north of Oregon Inlet before attempting to get gas or find lodging. Their resources are being affected b y the same outage. At 4:30 am, power went out to Ocracoke and Hatteras islands. We have since learned that PCL Construction, the contractors building the new Bonner Bridge, drove a piling through the underground cable between the southern end of Bonner Bridge and the first riser pole on Hatteras Island. At 7:45 am, Cape Hatteras Electric Cooperative, which owns and maintains that section of transmission line, sent a request for specialized transmission repair crews even before they knew the cause or extent of the outage. Those crews will be arriving at Oregon Inlet tonight to assess the damage. Depending on the extent of the repairs and the specialized materials required, transmission repairs could take anywhere from days to weeks to complete. Tideland's initial attempt to operate the Ocracoke generator was unsuccessful after a total 10 minute run time and resulted in equipment damage that currently renders the generator inoperable. Therefore, Tideland has located three mobile generators that will be transported to the island to run the island's three circuits to avoid rotating service schedules. 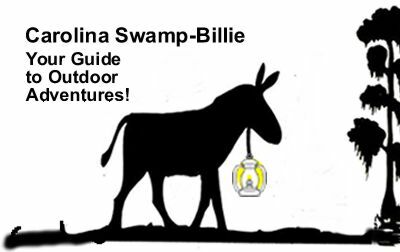 The three generators should all be on the island on Friday, July 28. The earliest you should expect electric service to resume will be Friday evening. 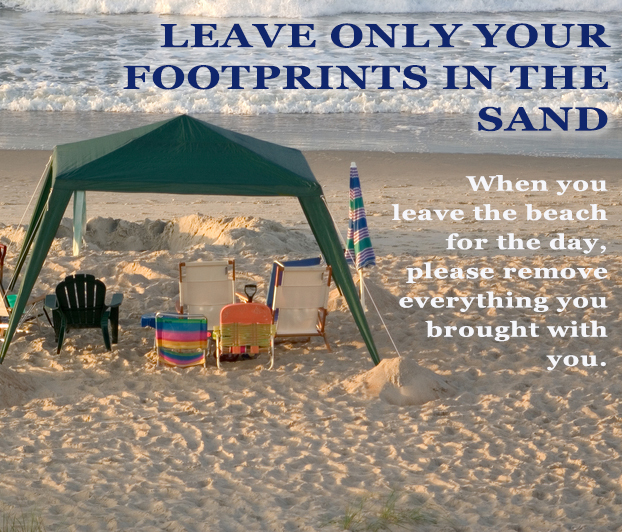 Town of Nags Head - Please pickup your stuff. Yesterday, the National Park Service located and then contacted the U.S. Navy regarding a potential World War II era unexploded ordnance that was found in a remote area on the southern end of Hatteras Island. Today, the U.S. Navy’s Explosive Ordnance Disposal unit arrived on scene and used controlled detonation to render it safe. Dr. Michael Piehler prepares samples in the lab. Effective July 1, 2017, Dr. Michael Piehler assumed the role of Interim Executive Director of the UNC Coastal Studies Institute (UNC CSI). Dr. Piehler has been an integral part of the growth and success of UNC CSI, serving as the Program Head for the Estuarine Ecology and Human Health research program since 2004. Dr. Piehler is stepping into this newly appointed role on the heels of the retirement of Dr. Nancy White, who served 14 years as the founding Executive Director for UNC CSI. East Carolina University (ECU) Provost and Senior Vice Chancellor Dr. Ron Mitchelson selected Dr. Piehler as the Interim Executive Director. “I could not be more pleased that Dr. Mike Piehler has accepted this role at CSI. Mike is an accomplished scholar with impressive leadership qualities. Dr. Piehler has been part of the CSI team for many years and that experience will be crucial in the upcoming year. I look forward to work with Mike as we grow key coastal programs at CSI”, said Dr. Michelson. The UNC Coastal Studies Institute is a multi-university institute housed at East Carolina University. Dr. Piehler has an impressive history in coastal and marine science in North Carolina. 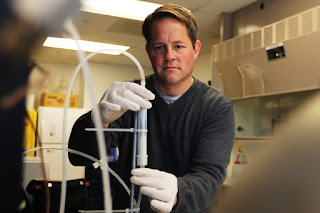 He received his PhD in Environmental Science and Engineering from UNC Chapel Hill, and since 1998 has been a member of the faculty at UNC Chapel Hill’s Institute of Marine Science. Dr. Piehler’s research occurs at the coastal land-water interface and is focused on quantifying the transport and transformation of nutrients. His research is funded by federal, state and regional sources and he serves on scientific advisory panels for governments, non-government organizations and industry. Dr. Piehler is excited about this next stage in the growth and development of the UNC Coastal Studies Institute. “I am honored to have been tapped by Provost Mitchelson to lead during this important period in the development of Coastal Studies Institute. We have remarkable people and facilities and I look forward to helping us excel”, says Dr. Piehler. 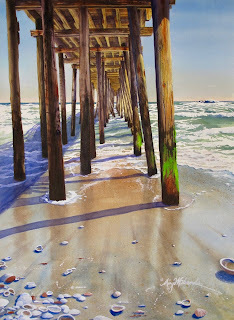 For more information on the UNC Coastal Studies Institute, please visit, www.coastalstudiesinstitute.org. Please join the Currituck Chamber of Commerce in celebrating CMIT Solutions, Inc. (Completely Managed Information Technology) ribbon cutting and open house ceremony. CMIT has opened an addition location in Powells Point, NC! 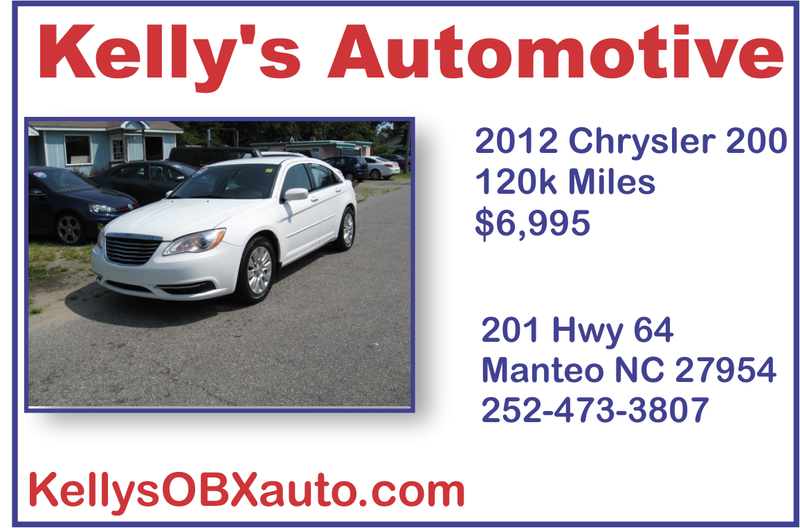 CMIT Solutions of the Outer Banks is a full-service IT Computer company. Their services include cloud servicing, Email Archiving, Access and Recovery, Hardware Purchasing, Help Desk, Outsourced IT Support, Proactive IT Services, , Application Development, Hosted Desktops, Mac Support, Network Support, Unified Communications, Visual Collaboration, Voice Solutions, Remote Backup and Disaster Recovery. Scott DeMasse, Owner/President, can be reached at 252-722-9222. 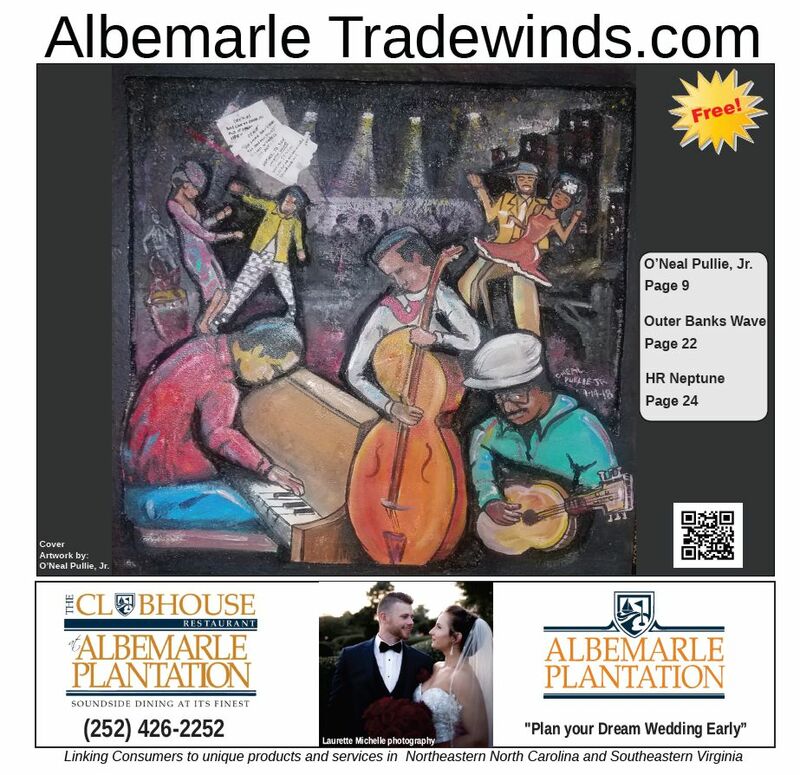 Tradewinds Media Group. Powered by Blogger.